Again and again, we've been overwhelmed by the number of people offering to help our little man. We've been told so many times, that Dexter has just 'gotten into their hearts' and they just love him. He's that kind of boy. If you've helped Dexter in any way, thank you. Some many times... saying thank you just hasn't been enough. Read our 'Overwhelmed' blogpost to understand a little more. Read more about the fundraiser here and see the fundraiser in photos here. Listen to Melissa sing to Dexter "Somewhere Over the Rainbow" here. Read more about Melissa here. Having a child with severe cerebral palsy is difficult. When he also has a vision impairment, it is a little more difficult. And, when that little boy also battles and beats cancer, all before he is two, life is very stressful and difficult. Sometimes, you just need a break. Melissa realised this and arranged a pampering day for Lenice. This day will remain a bright memory for years to come. 1. Jindaleespa Kiama - They gave Lenice a manicure and a pedicure. They gave her a facial and tinted her eyelashes. They gave her a glass of chilled bubbly, which she enjoyed as she relaxed. 2. Tusta Hair - pampered Lenice for three hours. She was given a half head of foils and a trim. Her hair was styled and her face was made up. 3. Classic Cars - Harry Mitchell drove up in a beautiful green 1959 Cadillac! The car had been brought to Australia from Las Vegas and Lenice and Andrew were the first people (in Kiama) to be driven around in it! He drove them to an from the restaurant. 4. Chachis Restaurant - provided Lenice and Andrew with a delicious meal. They ate lamb shanks and gnocchi, with a bottle of red wine. And, we asked the Illawarra Mercury to publicly thank Melissa and the businesses throught their newspaper. With almost no notice, Greg photographed Lenice and Andrew and wrote a lovely article about the day. An Inspiration for Peace Fundraiser was held on the 31st August 2013. This was an intimate concert at Wollongong Town Hall and was organised by Jane Hardy. $1600 was raised for Dexter. This money was supposed to go towards therapy in Melbourne, but there was a communication problem and Dexter was 'left off' the email list, so missed this opportunity. Instead, the money has been put aside and will be used while Dexter is having his intensive therapy in Adelaide. It will cover the costs of transport to Adelaide, accommodation, food and transport while there. Thank you. Michelle organised this fundraiser. 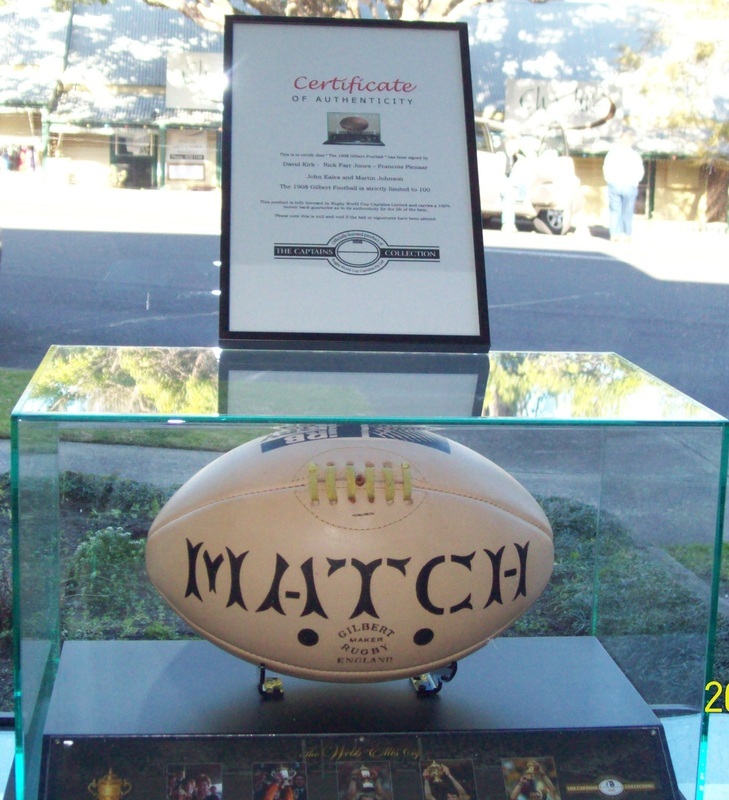 It was held at the Kiama Golf Club. $60,000 was raised. These businesses, organisations, groups and people all helped me and my family. We have been stunned by the generosity and support shown by our families, friends and community. Thank you so very, very much. During my chemotherapy treatments, Dad could count the hours of leave he had in minutes! Knowing we had funds from the fundraiser meant we could worry about my cancer treatment and not about bills and money. My cancer treatment months were just awful. The love and support we received from our community was incredible, and something we will always cherish. Thank you. 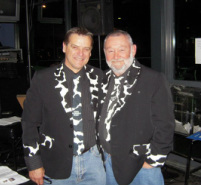 Many thanks to Mick and Al for their fantastic emceeing at Dollars4Dexter. Starlings on the Bay is a luxury beach house in Vanuatu.It sleeps 8 and has a private beach on Mele Bay. Thank you, Starlings on the Bay! Two Plane tickets to Vanuatu! Villa Pulau Mimpi has 3 bedrooms, a private rooftop & 6 person jacuzzi. Villa Pulau Mimpi - Our Island Dream Thank you, Jennie Pleace! A behind the scences tour valued at $4000... access to the Jockey room, weigh-ins and a race call, watch the "photo finish" being prepared.... and a $1000 betting voucher! Thank you! Weston Print did all our printing. Thank you! Woody (Justin Anderson) When he plays, the party starts! Woody played for us for free! The newspaper shared Dexter's story. Thank you Kerrielyn Clark. At Blowhole Point, Kiama, 2 nights in a luxurious Spa Cabin. Ph (02)42322707 Thanks! Kendalls on the Beach. A 3 day weekend package for 4 in a Garden Spa Cabin. Valued at $685! Ph (02)4232 1790 Thanks! Kiama Terrace Motor Lodge - 2 nights accomm. for two people, & breakfast. 'The Pines' is on a working dairy farm in the hills above Kiama. They gave us weekend stay. Thanks! Berm & Ains turned vegetables into delicious Thai food. Thanks! Lakeline Butchery donated $500 worth of meat! Thanks! Beach Bodz kindly donated a yearl membership $700! The Kiama Service Centre has given a $100 voucher. Thanks! Dapto High School Staff have been incredibly generous. Thank You! The Good Guys, Nowra donated a 32 inch led TV. These lovely ladies donated money to Dexter. Thanks! Mary Jane Burke donated a watercolour painting of Cathedral Rocks, valued at $220. Ph - 4236 0451 Thanks! The St George Bank in Kiama set up a free account for Dexter! Thanks!! Chopping boards, Spoons & Platters. 2 Boot Camp vouchers, worth $250 each! Thanks! Mark kindly donated a men's pack - with beer! Thanks! Zoe sent Dexter a new pram liner. She also gave a second pram liner and a nappy clutch! Thanks CZ Designs! A great team of workers organised a raffle for Dexter, using Jimmy's art as the prize. Thank you! Artrageous showed the "Hero's Journey" - an interpretation of mental health recovery. Jimmy Storey, a Gypsy writer, musician and artist donated art pieces for Dexter. Thanks, Jimmy! My Ulgundahi is a personal reflection on Ulgundahi Island, the island that my mother's family grew up on in the Clarence River in northern NSW. 43 shapes of the island have been placed to signify 43 years since the 1967 referendum. The work features both landscape and aerial views of the place I’m most familiar with, The Clarence River and Ulgundahi Island. The colours used are significant in that they are colours that evoke a particular emotion derived from this special place. The 43 islands featured become a peephole to what surrounds it, without these surrounds the island couldn’t survive, without this island, I wouldn’t be here. Thanks so much!! 1000 custom designed business cards -valued $150! 3 balls sold in our auction! Thank you! Embellish Kiama is a ladies boutique. $50 card! Stone Wall Cafe gave a $50 voucher. Thanks Stone Wall Cafe! The Kiama Rotary Club helped Dexter. Thank You! Hair Justice gave 2 haircuts! Thanks! Leisure Coast Fruit Market and Deli helped with the Thai Night by donating vegetables. Thanks! They donated a stainless steel 'Digadoo' garden spade ($105 Retail), $150 gift voucher & a 1hr consultation ($120). Thanks!! QBE Insurance donated a NSW Swifts signed and framed 2012 dress. Thanks Chris Evans Framing! So much work done for us! Photo shoot & photos worth $900! Thanks! Services! 1 day's labour! Thanks thatpetshop for donating a $250 pack of dog's toys! Thanks Chantik Jewellery for your lovely donation! Thanks Kiama Jewellers! A Luxury Watch, valued at $539! i98 gave 2 tickets to Circus Oz. Thanks! We will have some Robbie Maddison gear, signed by Robbie, to sell on the night. Thanks! A 2001 framed Brisbane Lions Jersey. Thanks Lorraine! Thanks Panthers! Sophie donated lovely pieces of jewellery. Thanks, Sophie! It's Green Slip time! Thanks NRMA Kiama! Donna, Andrew and Leo heard Dexter's story and donated wine. Addison's donated items for Dexter. Thanks! Thanks! A family pass to the zoo! An auctioneer to help on the night. Thank you! Kiama's Shaun Timmins -retired rugby league footballer. (NSW State of Origin, Australian international rep., Steelers and Illawarra Dragons.) We have a signed Shaun Timmins jacket! Thanks! Josh Morris (Canterbury Bulldogs) & Brett Morris (St George Illawarra Dragons) generously donated from their personal team-signed jerseys. Brett and Josh Morris once played for Kiama Knight's Juniors. They now play for NRL clubs & both represented NSW in State of Origin and Australia. Thank you! Lovely local ladies lovingly stitched a quilt for Dexter's fundraiser. Thanks! Branches Restaurant offered us two $100 vouchers for their restaurant. Thank you! Towels, thongs, hats and bags! Thanks Zink Surf! Priceline Kiama donated Mothercare baby products and a Nuk starter kit. Thanks, Priceline! Jenny kindly gave us an Avon package. Thank you Jenny! Two nights at Spring Creek Retreat Cottage, with port & chocolates. Thanks! 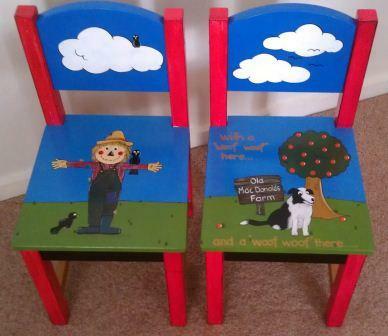 A gorgeous children's table and chair set has been lovingly painted by Erica. 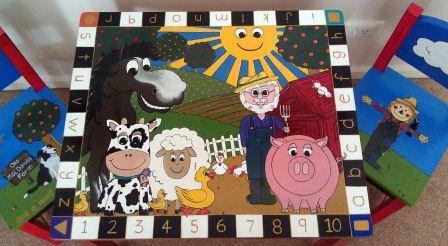 The basic design is "Old MacDonald has a Farm", with most of the animals and some of the lyrics featuring around the set. 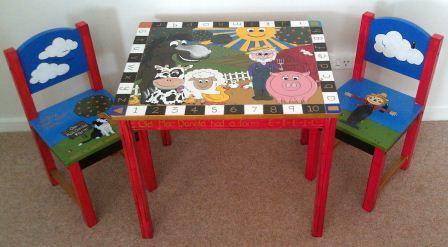 Erica always includes the alphabet and all of the colours of the rainbow, so the table can also work as a learning tool. The table and chairs set is valued at $500. Frank gave an amethyst crystal. (35cm tall and 13 to 8cm across, 13cm thick at the base & 6cm thick at the top) Thank you Frank! Dexter's grandmother made bags, placemats and table runners. Thanks, Wendy! Phyllis heard about Dexter and started a collection, raising over $300. Thanks Phyllis! Kiama Kreations donated beautiful goat's milk soap. Thanks. Catherine kindly gave a bottle of Chatelle rare old French brandy. Thanks, Catherine! Weekend holiday house, sleeps 7 people. Valued at $700. Hanoi on Manning offered us a $50 voucher!